Full color Custom Oval Static Clings produces more complex and vivid images than those produced with screen printing. If you need a photo printed, or just multi-color, high definition detail such as art with special effects or smooth gradients, digital printing is the best choice. BBB Member since 2004 with a proven record of complaint free customer satisfaction on items like Custom Oval Static Clings and Full Color Oval Window Clings. Click on the BBB logo above to check our record or leave a customer review. 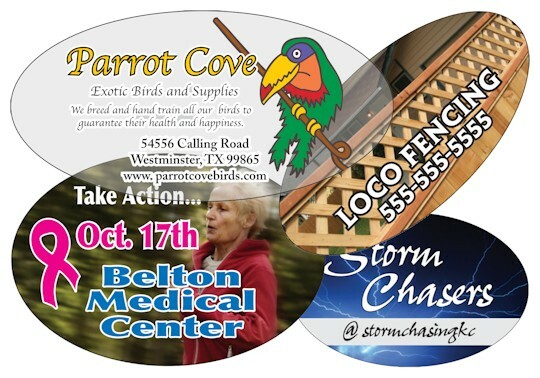 At deSIGNerySigns.com we have more than 24 years experience in designs for our Full Color Oval Window Clings. Call us today and let our design specialists help create your next project to promote your product or business. Free Shipping | Free layout | A+ BBB rating | 24 years in the business | Call Today for a free quote on Full Color Oval Window Clings. No-glue labels can be repositioned without damaging there ability to cling again. When your customer removes the custom Oval static clings from the surface they applied it to, they do not have to worry about that messy adhesive that some standard stickers leave behind. Also you do not have to worry about chemicals in adhesive type stickers damaging the surface. Custom Oval static clings have no adhesive, but will cling to most flat, smooth surfaces such as glass, glossy plastic and glossy painted materials. IF YOU WILL BE USING THESE STATIC STICK DECALS ON ANY SURFACE OTHER THAN GLASS, ASK FOR A FREE SAMPLE PRIOR TO ORDERING AS WE CAN ONLY GUARANTEE THIS PRODUCT ON SMOOTH FLAT GLASS! Our best value custom Oval static clings are screen-printed on clear .007" static cling material. Make sure to specify when ordering if you want face adhering or back adhering. Face adhering is for placing on one side of a glass pane and you want it to be read from the other side. Always request samples of the exact product you are looking for when buying online. Our best value Oval window clings are the same quality as our other no-glue labels except they are limited to 12 sizes listed on pricing page. For window clings printed in other sizes and if white Oval non-adhesive stickers are needed, please visit our custom size full color or custom size spot color for pricing. If the above sizes will work for your project and Oval is what you were looking for, this is the product for you. These Oval window clings are great for just about anything imaginable! If you are looking to advertise an event, your school team, temporary instructions or warnings on your product, this is an awesome alternative to Oval decals. Spot color offers a long term use of static clings and a lower cost for 1 and 2 colors in small quantities. If your company has pms requirements for logos or text, screen printing is the only process for printing. Static clings are not recommended for outside but can be used on the inside of car windows and store fronts. If the Custom Oval Static Clings is used for this purpose, spot color is always recommended.